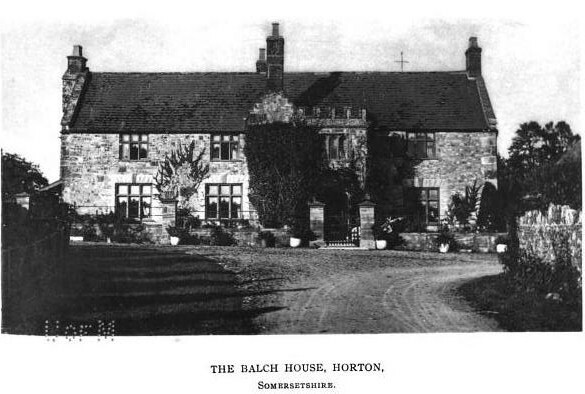 George Balche (1584 - 1658) of Horton, Somerset, England was born to Nicholas and Sarah (May) Balche. George is recorded as having substantial wealth attained from various valuable tracts of land. In 1623 the Heralds of the College of Arms summoned George (as the head of the family) to establish the family's right to bear the Balche Coat of Arms and that right was confirmed. At this same time George was a bachelor and the evidence suggests that he never married . At some point George had a house, built in the Tudor style, that still existed in the late 1800's (it may still exist). George, like his father and grandfather before him, spent some time as a trustee for the Ilminster Free Grammar School. George's years as trustee are recorded as; 1600, 1605, 1606, 1607, 1633, 1635, 1637, 1639, 1642, 1645, 1647, 1648, 1650, 1651, 1655, and 1656 . During the English Civil War, of 1642-51, George would remain loyal to the forces supporting King Charles I against those of Parliament. When Royalist forces were in possession of Somerset George was appointed to the position of coroner for the county. When the Parliamentary forces won the war George was forced to pay a large fine for his support of Charles I. The fines George paid amounted to one sixth of his property's value (221 pounds sterling and seven shillings) and were paid in order to prevent seizure of his lands in Ilminster and Coker (Somerset, England). George died sometime in 1658.